Whenever I come into a bumper crop of quality herbs, usually at summer’s end, I refrigerate some and dry the rest. Technically, any herb can be dried, but heartier herbs like oregano, thyme and rosemary tend to hold on to their essential oils even after they’ve given up most of their moisture. That said chives, parsley and even dill are worth drying if you plan to use them within a month or so. The biggest problem with dried herbs is that they’re usually ugly and brown. That’s because, as they age, enzymes inside the leaves break down the chlorophyll. But this chemical terminator can be stopped with a quick dip in boiling water. Bring a pot of water to a boil and blanch the herbs for 15 seconds. Immerse in an ice bath for 30 seconds, then drain and spin the herbs dry in a salad spinner. 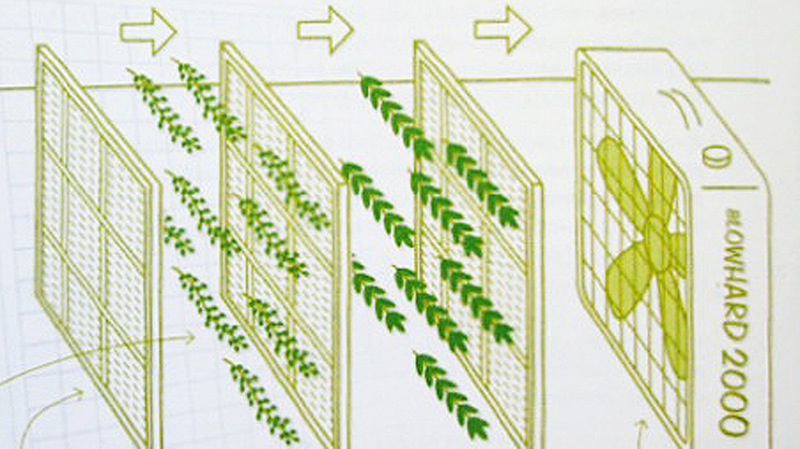 Spread the herbs out as evenly as possible on 3 air-conditioning filters, stacking them on top of one another. Top these with one more empty air-conditioning filter. Lay a box fan on its side and set the filters on top of it. Strap the filters to the fan with 2 bungee cords. Stand the fan upright, plug it in and turn it on high. Dry for 12 hours. Rotate the filters and continue drying for 12 more hours. When dry, remove the herbs from the filters, crumble and remove the stems and store in an airtight container in a cool, dry place. You can either mix them up or keep them in separate containers. I have found a really low heat dehydrator for at least 24 hours keeps the green and dries them well, even in moderately high humidity. Very low temp is the key on herbs. Also learned it is best to do chives and garlic chives outside to start with or the whole house smells like chives. AT LAST, a thinker and leader in the cooking arena. A Fabulous way to keep my herbs. BLESS YOU. Are the filters on the intake or output side of the fan, or does it matter? I’m not crazy about using furnace air filters next to food… hmmm…. Thank you for writing about storing herbs. Can you teach or write about what dry herbs/spices to apply or put on vegetables, meats, chickens and fishes? Are there right dry herbs/spices to put on certain protein when cooking or marinating?